Glamping and luxury camping is at an all time high and as we beckon in a new season, we check out the freshest glamping sites on the scene. Glamping has never been so popular and in a modern world of smart-phones, digital devices and finger-tip technology it only follows that fold-out kitchens and hologram hotel-suites are soon to be a part of the next holidaying generation. Today it is possible to sleep out beneath the stars and re-engage with nature without forgoing the comforts of a decent bed at night. And whether you're after shepherds' huts, bell tents or glamorous Mongolian yurts there's bound to be something that fits the bill. Glamping is an ever-modernising business and with every year we find new sites, new facilities and new comfort-ensuring ideas. All glamping sites, though, share the same underlying ethos: provide the 5-star experience while still letting you breathe in the air of the great outdoors. Click here for our full list of the best glamping and luxury camping sites in the UK and Europe or check out our selection below of brand new glamping sites opening their doors for the first time in 2015! While Barefoot Cornwall and Barefoot Dorset are brand new sites for 2015, the people behind the Pop-up Hotel, who have created these gems, are far from new to the scene. Bringing the most up-market glamping to festivals throughout the UK and Europe these guys have tried and tested the glamping market and know exactly where to find the very best of accommodation and facilities. Think vast lounge spaces, deep king-sized beds and en suite facilities all in glamping units just a short walk from the beach. With a wood-fired hot tub it's easy to spot the luxury at Gooseberry Field Glamping. Owner's John and Kerstin pitched up in this five-acre field when they tired of city life and this year have opened it up to fellow London escapees who make the 15-minute journey from Ashford International Station. Comprised of five lovingly furnished bell tents, a luxury tipi, a shepherd’s hut and a vintage 70s caravan, it’s a place that appeals to all tastes and budgets. Domaine des Mathevies is nothing new, back in 2011 it came first in Cool Camping France’s pick of the best campsites in the country, and Glisten Glamping is nothing new either – their first site opened back in 2014. But the two combined is a first for this year’s season and very much a winning combination. Glisten’s unique geodesic domes offer a quirky and practical glamping space, full of mod cons and chic minimalist furnishings, while located on one of the best sites we know. Well, what more could you want? 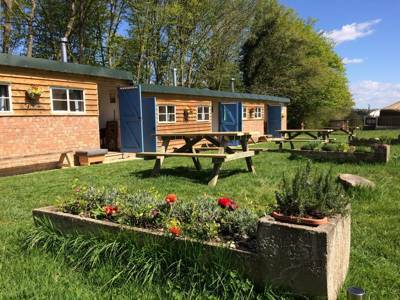 Between the beaches of Overstrand and the town life of Cromer, The Grove Glamping boasts a fabulous North Norfolk location. Starting life as a regular summer pop-up for exclusive hire, The Grove Glamping has proved such a success that it seemed mad not to share it with fellow coast-bound-campers. Comprising five comfortably-furnished bell tents, proper bedding and warming wood-burning stoves are the order of the day here, plus a heated indoor swimming pool and an award-winning restaurant. An unusual name for an unusual campsite. Have you ever thought about sleeping out in a double decker bus? Probably not, but take a nose around this Shropshire campsite and you’ll realise it’s the obvious choice. The bright blue 1980s Leyland Atlantean is kitted out with a fully-fitted kitchen and an entire top-deck sleeping area with three bedrooms and unbeatable views. It’s not only a new find for 2015, it’s a pretty original site for the world of glamping altogether! John and Montse actually opened their glamping in the summer of 2014, testing the waters of their Catalonian campsite, but it's unclear why a trial was ever needed. With its spectacular views and lovingly furnished bell tents positioned across five hectares of woodland and fields, it's difficult to see how this site was ever set to fail. Now fully opened for 2015 it's time for Forest Days to enjoy its moment in the sun – moments best enjoyed with a glass of the local vino and a dip in the nearby glistening river. The name may ring a bell, Grey Willow Yurts has been heralded by Cool Camping as a favourite for years, so it was a huge shame to hear last year that the floods of 2014 caused mayhem at this glorious glamping site. Worry not, folks, Grey Willow Yurts are back and better than ever, opening up for the 2015 season as a whole new site featuring timber built huts with all the trimmings – think plump double beds and wood burning stoves. There's also an array of onsite activities including falconry, woodwork and physical theatre workshops! Tour de France, Tour de Yorkshire, Tour of Britain – if cycling in the Yorkshire hills tickles your taste buds then there’s no prizes for guessing the focus of this glamping site. It’s the perfect time for the pods at York Cycle Stop to open their doors, as the ever-growing cycle frenzy continues to centre round this idyllic part of North East England. With the likes of free cycle lockers for each pod, bike cleaning and service facilities and a drying room, it’s all kitted out for spandex-clad, hill seekers and the perfect layby when you’re out on the roads. Tŷ Cerrig Woodland Retreats is set to feature four stunning shepherd's huts but in this, it's opening year, there are just two abodes to choose between, making it a thoroughly exclusive experience. In amongst a re-wilding forest, in pockets of clear space where the undergrowth ends and a grassy space provides enough room for your campfire and picnic table, these glamorous huts are a cosy Welsh hideaway. With en suite bathrooms, well-equipped kitchenettes and all the utensils you need, they're a year round glamping haven. High in the Andalucian hills, the Green Mountain Yurt is a spectacular new site that puts 21st-century technology to good use. A sunny location supplies solar-powered lighting and water heating (wind energy is used to add a little extra power) to this exclusive yurt, the sole accommodation on site. With no-one to disturb you and a private area of patio, garden and a shaded outdoor kitchen on offer, it’s a real hideaway for those heading to the continent. Glamping pods can get a hard time for not having that archetypal camping shape and the romantic canvas looks of a bell tent or yurt. But make no mistake, these two exceptional pods are truly the tip-top of glamping accommodation. Inside you're guaranteed warmth, comfort and thoughtful touches (like the dressing area with hairdryers and a large mirror) while outside spectacular views are matched by more handy features like a wash area for bikes, dogs and boots. There's even an honesty shop with everything you need for the barbecue. Nestled in the beautiful countryside of the Blackdown Hills, Dimpsey Glamping may be brand new but it is finished to perfection. Owner Em has gone over the whole place with a fine, interior designer’s tooth-comb and the resulting accommodation is a real treasure to behold. In fact, the décor is so good you can go online afterwards and buy interior accessories from their online shop! No, there's nothing new about Little Halden Farm in the heart of the Weald of Kent, the farm has been here for decades and so too have the hop-picker's huts once used as workers humble accommodation. This year, though, the thoughtful folk at Little Halden have decided to rejuvenate the old sheds and turn them out into something unique and beautiful – some quirky glamping accommodation. Somewhere between a stable, a self-catered cottage and a Kentish camping haven these new conversions are a cool new addition to the site and add some extra sparkle for the 2015 season. 'The place where London ends and England can begin' is how G.K Chesterton described The Weild and this 15-acre site, on the wooded fringes of the village of Westcott, certainly makes the most of it's surroundings. The creation of garden designer David Seales and farming enthusiast partner Joanna, it's fair to say they know how to get everything out of the landscape and, after nearly two and a half years in the making, it's great to see these glamping yurt doors wide open and welcoming guests at last! Click here for a full list of all our favourite glamping sites in the UK and Europe.